Have you been to the pumpkin patch yet this year! Some may be saying yes, or you may have had some keepers in your very own garden, or perhaps you were given some from somebody. All of which leads to one very fun event! Pumpkin carving! We thought we would create a fun board on Pinterest that is full of pumpkin fun! Come check them out by clicking on the green link below! Here are some pumpkin patches too, in case you are still looking for a place to pick that BIG pumpkin! At WillyTee’s the kids will have fun going through the fields to find the perfect pumpkin. They will be able to explore a fun farm where they have face cuts out and even several spots set up for you to take some fun fall photos. Plus Moms… there is a wonderful area that is full of holiday decor that you can’t help but want. You also get to leave with a special souvenir to remember your visit with, a custom caricture made just for you… for FREE! The staff is awesome and the prices are family friendly. At the Pumpkin Patch, your kiddo will find a pumkin and also be able to explore the grounds. There are many fun face cutouts, huge hay bale art, corn maze, straw pit, and a few animals that they can check out. A hay ride is available, which gives you a tour of the fields. At the front of the farm, you will find an area set up where you can purchase gourds, squash, and cranberries. They also have some beautiful potted arrangements, that include sunflowers and winter cabbage, to spiff up and brighten your fall arrangements on your porch. Parkerosa offers a field of a variety of different pumpkins. There is a petting zoo, corn trails, and refreshments available. There is also a wagon ride that give you a tour of the Parkerosa farms, where you will see some themed buildings to spark the imaginations of your little ones. There is also some holiday and rustic themed decor available in their gift store too! 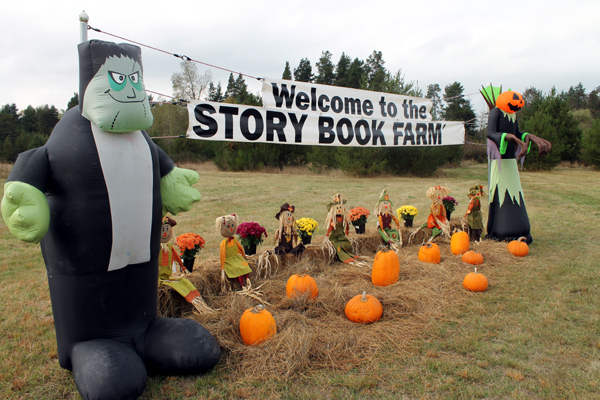 Story Book Farms Pumpkin Patch ~ 5050 Jackson Hwy, Toledo, WA 98951. Open Monday through Sunday from 10 am to 8 pm. (360)864-4388. Rows upon rows of pumpkins are available for you to choose. Story Book also offers a hay ride, bounce house, and games. Please feel free to suggest more local pumpkin patches as well as pictures. Also we’d love to see your carved pumpkins. Send us some pictures! We hope you have a fun time celebrating this spooky time as well as fall harvest with your kiddos! Happy carving time Discover! Families!